The Chrosziel Mattebox system brings professional shading and filtering solutions to Sony's EX1. Loaded with the benefits operators have come to expect from Alfred Chrosziel, features include a true 16:9 housing that covers both 16:9 and 4:3, filterstage for 2 filterholders (one 4x4 rotating [402-12] and one 4x4/4x5.650 fixed [410-04]), a full-size French flag and 110:91mm ring. 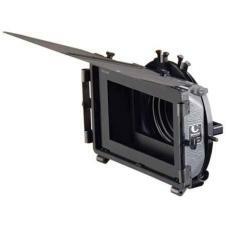 For a secure mount, the system comes with a center bracket and 15mm lightweight support with adjustable mattebox rods. Chrosziel's efficient design includes many new operating advantages. Dual pivot mechanisms are integrated into the housing for more cost efficient use of side wings. The system's articulating French flag can be teamed with optional side wings for precise manipulation of light. Protection against flair and loss of contrast is provided by a 16:9 insert mask. A one-sided quick-lock mechanism anchors the mattebox system to the 15mm lightweight support with a simple twist of a knob. For authentic cine-style feel and function Chrosziel's DV Studio rig follow focus can also be added.